I was with her at the Cultural Center of the Philippines, Jan 28. She watched the Broadway Musical Wicked. She bought a ticket for a front seat from an authorized ticket outlet here in Manila way back September 2013. Early September of 2013 she learned from an office mate the Broadway Musical is coming to Manila January 2014. While I waited patiently at the lobby, you read it right. I waited at the lobby for three hours I am unable to afford a front seat ticket. When my niece bought the ticket she offered to buy me a ticket at the back seat. I declined as I thought the distance is too far for my near sighted vision. I learned a lesson. The next time there will be another visit to Cultural Center of the Philippines and if I will be offered the same. I would gladly accept. The musical show started promptly at seven- thirty in the evening and ended at ten-thirty. My niece was all smiles after the show. I knew it from her expression it was worth the amount of the ticket she paid for. We took a taxi, thanks goodness there was no traffic jam we were home at eleven. The girl was giggling while telling me a lot of stories about the show. She sent text message to her mom, who lives in the province southern part of Manila. 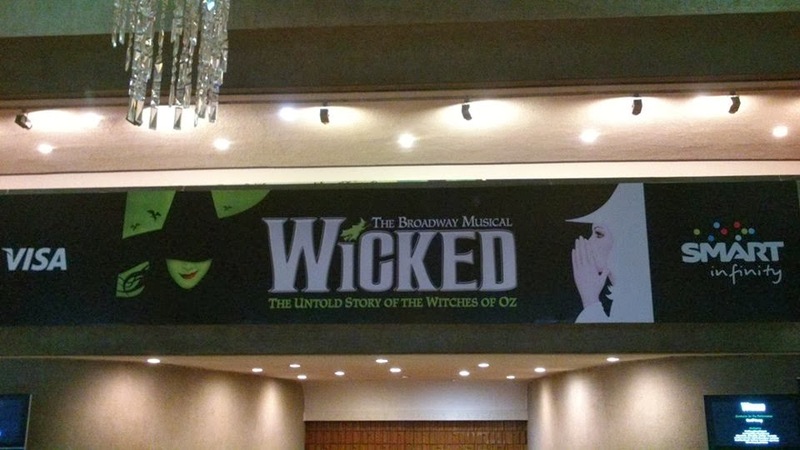 My sister was happy as she heard from her daughter a lot of stories about the Wicked Musical Show way back when my niece was in college. Years later, it was a dream come true for her daughter.